City of Montgomery county, New York, on the Mohawk river, 33 miles northwest of Albany; population in 1900, 20,929. The earliest Jewish residents were Harris Davis, Isaac Mark, and a Mr. Rothenburg, in the order named. In 1865 Julius Wasserman came to Amsterdam, and in 1886 was appointed postmaster: a little later he erected a broom factory, that of the Amsterdam Broom Company, with which Mr. Wasserman and his son are now associated. Since then the Jewish community has grown rapidly, and in 1900 numbered about 250, of whom about 125 were attendants at the Reform Temple of Israel, the remainder attending the orthodox synagogue. 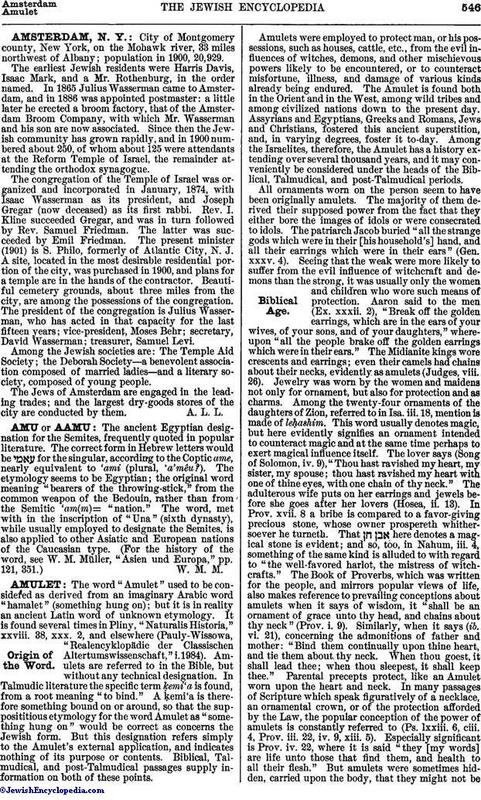 The congregation of the Temple of Israel was organized and incorporated in January, 1874, with Isaac Wasserman as its president, and Joseph Gregar (now deceased) as its first rabbi. Rev. I. Kline succeeded Gregar, and was in turn followed by Rev. Samuel Friedman. The latter was succeeded by Emil Friedman. The present minister (1901) is S. Philo, formerly of Atlantic City, N. J. A site, located in the most desirable residential portion of the city, was purchased in 1900, and plans for a temple are in the hands of the contractor. Beautiful cemetery grounds, about three miles from the city, are among the possessions of the congregation. The president of the congregation is Julius Wasserman, who has acted in that capacity for the last fifteen years; vice-president, Moses Behr; secretary, David Wasserman; treasurer, Samuel Levi. Among the Jewish societies are: The Temple Aid Society; the Deborah Society—a benevolent association composed of married ladies—and a literary society, composed of young people. The Jews of Amsterdam are engaged in the leading trades; and the largest dry-goods stores of the city are conducted by them.